The Lion Comic Book Hero Bible is a brand new comic book style Bible intended to appeal to children and young teens. The comic Bible begins at the very beginning of creation and ends with Jesus triumph return we are still waiting for. The Bible contains very colorful illustrations and you can tell it took a great deal for time for the artists to craft every single design. I loved how the comic Bible looked like I was reading the latest episode in the X-Men comic book series. The cover was very well designed in order to lure children into wanting to learn about the Biblical characters. One of my favorite scenes was when Joshua and Caleb had no doubt that God could protect and help them defeat the massive giants. These giants was portrayed tough and they looked like evil villains you wouldn’t want to come across. I would recommend this amazing comic book to children and young teenagers. This comic Bible would make a great introduction to children who are eagerly wanting to learn more about our loving Creator and the lessons found in scripture. I enjoyed reading this dynamic new comic Bible and I highly recommend it, if you’re a fan of comics! The story of the Bible is a unique tale of origins and cosmic powers; of the ageless battle between good and evil; of human potential and human treachery; and of a Messiah--a savior for the world. This is indeed the stuff that graphic novels are made of. Superheroes are the biggest comic genre of all, with many heroes having their origins in biblical characterization and imagery. This is the first Bible retelling to engage with and challenge the superhero genre. 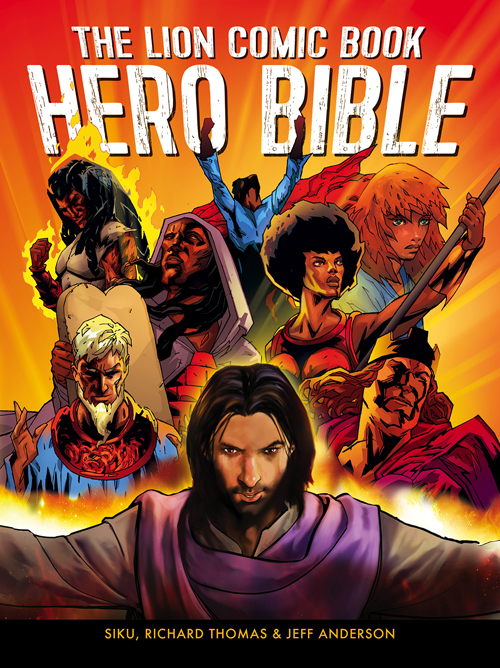 The Lion Comic Book Hero Bible is a dynamic expression of the Bible's depth and power, produced in the style of Marvel Comics. You've heard of Spiderman, Superman, and Wonder Woman. Now meet Earthman, Lawman, Warrior Man, and many others. With dynamic illustration using a range of styles, Siku (Old Testament) and Jeff Anderson (New Testament) bring the Bible stories alive for a new and graphically sophisticated generation. I’m a member of the Family Christian Bloggers and they provided me with a free copy of “Power Up” for this review. Power Up is a brand new devotional written with golfers in mind. Each day includes an approach shot, a scripture verse, a short story relating to golfing, a fast fact, playing through encouragement, and a top 100 golfing courses in the United States. I would recommend this devotional book to anyone who enjoys reading about golf and they like to play the sport of golf. This book contained countless information about different professional golfers as well as personal stories. I love how Dave Branon related every story to a lesson from scriptures to inspire believers in their journey thru life. One of my favorite lessons was day 21 entitled, “Plans for Paul”. This one shared the verse Philippians 3:14 and pressing on to the end goal to win the prize called in Christ. This day told the story about Paul Stankowski and how when he was in a very challenging match, he had to press on through the difficult. He was attempting to quality for the PGA Qualifying School and he ended up winning. Paul credited God for his winning and he was determined to serve God where he was. The book also explored how Paul had to press on in order to triumph and win the prize and to forget the past. I loved the encouragement section in playing through because it enclosed questions readers could ask themselves in order to dig deeper in their faith. If you’re seeking a great book for golf lovers, then read this one! The holidays are a busy time . . . but life can be even more hectic! In the midst of work, after-school activities, grocery shopping, and business trips, how are parents supposed to find the time to build within their families a lasting foundation of faith? Focus on the Family wants to step in and give you some tips. Sign up by clicking here for a free e-book called 101 Surefire Ways to Strengthen Your Child's Faith. With creative ideas on weaving faith into everyday conversations, turning family activities into learning opportunities, and having faith-filled holiday celebrations, this book is jam-packed with fun and interesting, easy, faith-building ideas for your family. Another fun way to build your child's faith: have a family craft night and use it as a faith-building opportunity! Click the image below for a printable Town of Odyssey cutout set. Bonus points if you listen to an Adventures in Odyssey episode while you put together your town!